The New Year is approaching, and for many of us that means making New Year’s resolutions. Not surprisingly, the number one New Year’s resolution for 2014 was to lose weight. To accomplish this, most people diet and ramp up their physical activity. Motivated for the New Year and the prospect of a slimmer healthier self, often times people jump on the treadmill and attempt to run multiple miles a day, day after day. More miles equals more calories burned which brings you that much closer to the “beach bod” you need to have for next summer’s vacation. Sounds like a great idea, right? Maybe not if the closest thing you’ve had to high physical activity recently was power shopping on black Friday. There is a smart way to get fit for the New Year that will keep you in the gym beyond the first week in January, and possibly save you the trouble of an injury such as a stress fracture.With an increase of health conscience people in recent years, doctors are diagnosing stress fractures more frequently. 95% of stress fractures involve the lower extremities, particularly the metatarsal bones of the foot. A stress fracture is a subtle break in the bone that is often not detected on x-ray exam. This sometimes leads to a misdiagnosis, resulting in the stress fracture going untreated resulting in chronic, frustrating pain. The most common cause of a stress fracture is a sudden and great increase in physical activity, especially in someone who has not been physically active previously. With this information in mind, be smart about how you approach getting back to the gym. Avoid trying to lift heavy weight or run long distances right away. Instead, take a stepwise approach by slowling increasing weight and distance weekly or even biweekly. 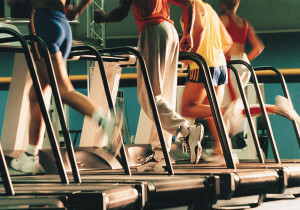 Consider using the elliptical or recumbent bike as a low impact means of obtaining a good cardiovascular workout. Finally, make sure you are using appropriate athletic sneakers for running (see our prior blog for more information on this topic). If you do find yourself with an injury, don’t ignore it as it could potentially make the problem worse or delay healing. We specialize in sports medicine injuries of the lower extremity. The faster an appropriate diagnosis is made, the faster you can get back to full activity.